I am not a scientist nor am I an inventor. I like to create things with words and occasionally reclaimed wood, but I understand the base impulse of creating something to be more efficient. In our modern times we find technology to improve ordinary tasks, from dishwashers to automatic pencil sharpeners. It should not surprise me, therefore, that throughout time humanity has found increasingly efficient ways to kill one another. The movement toward efficiency necessitates the creation of something to make the process quick, as painless as possible, with little personal pain or torture. Perhaps this progression was inevitable -- the spear-launcher was bound to give way to deadlier projectiles and, if we have seen increased efficiency in all other areas of our lives, from smart phones to smart cars, it is only logical that we would have further refined instruments with which to kill another human being. I am not a sociologist, but I suspect that this results in some sort of disregard for the humanity of another individual -- that pulling a trigger is an easier decision than choosing hand to hand combat. I should be clear, this is just my feeling, but the level of aggression it takes to kill someone with your own two hands is a sustained aggression instead of a momentary one. Which is perhaps why guns are seen as tools of aggression that "prime" us to act and think more aggressively when they are present. I am not a lawyer but I did study the Constitution and the Bill of Rights in my middle and high school years. As best as I can discern "a well regulated militia" is not folks open-carrying through Target (unless, of course, there are threats to national security in Target). A year or so ago a poorly-prepared article suggested that the second amendment was drafted to regulate slave militias in the states. The piece was thoroughly discredited for reconstructionist history and yet the initial paper that sparked the idea by Roger Williams University School of Law professor Carl T. Bogus still stands as perhaps the single most compelling case for Madison's deliberate wording and constant revision of the language of the second amendment. I'm not a historian, but based on Bogus' research, a cursory survey finds that there was perhaps much for slaveholders across the south to fear, considering that there had been no less than eleven insurrections by slaves in the colonies, not to mention countless smaller local rebellions.The bloody Stono Rebellion in South Carolina in 1739 saw a group of forty slaves commandeered a munitions storehouse, taking weapons for themselves, burning at least seven plantations and killing between 20 and 25 white plantation owners and workers in the process. This notwithstanding the fact that as Madison drafted the Bill of Rights in 1789 gestating just south of America was the slave revolution in Haiti, even as revolution was also underway in France. In the colonies could throw off England and slaves and commoners upset the empire of France, what would prevent armed slaves from doing the same? I'm not a gun owner but, if present sales data are to be believed, I'm not the target market either. 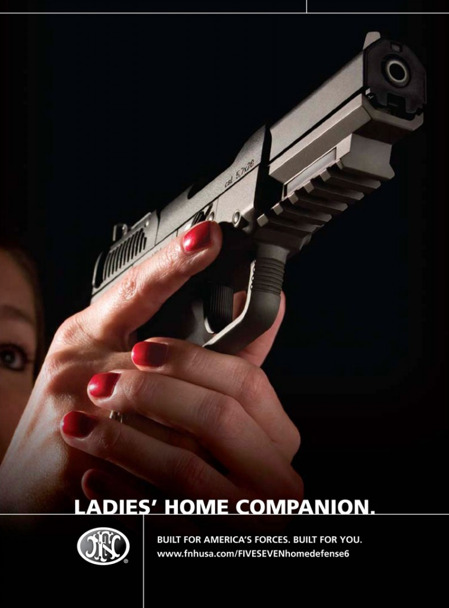 Increasingly women are purchasing guns and getting training, most typically handguns. Reasons aren't just for self-defense, but include sport and target shooting, though clearly that's not how gun manufacturers are pitching them. I wonder, when doing the psychological work of how to market to women, if these manufacturers and advertising executives considered exactly what kind of bogeyman they were conjuring up to keep women from being a "victim". Close your eyes. Imagine someone breaking into your house in the middle of the night. What does this person look like? What's their gender? Their skin color? What is there life story? I also can't help thinking that if I did own a gun -- one that was locked in a safe, secured in my suburban home -- if someone stole it and used it to shoot at a complex with over 145 children living there, would I feel some complicity, even if I wasn't the one who used it? 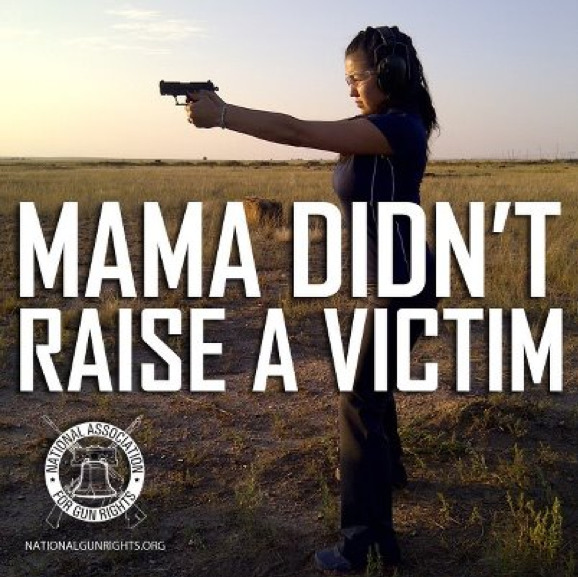 I'm not a victim, but I know many of them. In fact, some of them likely resemble the bogeyman we were just collectively picturing. Children reared in a culture of violence, who hit the ground when a balloon pops or a car backfires. Children with diagnosable PTSD, similar in every way to war veterans except veterans come home from the theater of war and these children grow up in it every single day. I am none of these things, but I am a minister -- a minister of the Christian tradition, a term which claims a goal of being "little Christs" to God's world. Demographical data, historical precedent, legal interpretation, cultural mores and modern advertising do not influence me in matters of conscience and faith, at least they are not supposed to. It's hard for me to reconcile this Jesus -- this supreme gift of God's creation, with an instrument of utter destruction. Some have appropriated the current gun conversation to ask "What Would Jesus Carry?" but I'd rather take it one step further and ask "Who Would Jesus Shoot?" Guns are manufactured for shooting with unprecedented precision. They have no other purpose. They are ruthlessly, relentlessly efficient in this task, and yet I can't see Jesus holding one. Some tell me this belief is simply not practical -- that there are "bad guys" who must be stopped and the best way they are stopped is at the end of a gun. I can understand the social ethic there, and yet I wonder if another way is yet possible. In the United States Holocaust Memorial Museum in Washington DC is a picture of a Polish priest. In the background is a freshly dug mass grave and just in front of it the bodies of those already killed. In the immediate foreground is the rifle of a Nazi officer, aimed directly at the head of Father Piotr Sosnowski. Father Piotr was not a Jew, and yet he was a threat to the state as he cared for those of the city. Those who rode with him to the execution field in Northern Poland reportedly suggested making an escape at one point, but Father Piotr discouraged it, saying that if they went resolutely perhaps they would spare others in town who might have time to escape. I can only assume that the guard who took the picture wished to artistically show the superiority of the gun and its power to take the very life of another human being, and yet the picture tells a different tale. The Father stands not with bowed head or on bended knee, but resolutely -- staring down the rifle and perhaps the very eyes of its operator. The hands are at his side, the knees relaxed. He usurps the power of the gun with inexplicable resolve -- the kind of faith and belief I can only believe Jesus had in the garden when he told Peter to hide the weapons cache. I think Father Piotr knew what Jesus was talking about. I think he knew something about the idea that "no one can take my life from me but I lay it down as a ransom for many". This is the way the Christian is called to. This is what I am called to as a minister and a Christian. You can choose to be behind the gun or in front of it -- that's your choice, but it's not hard to know which end of the rifle Jesus on.